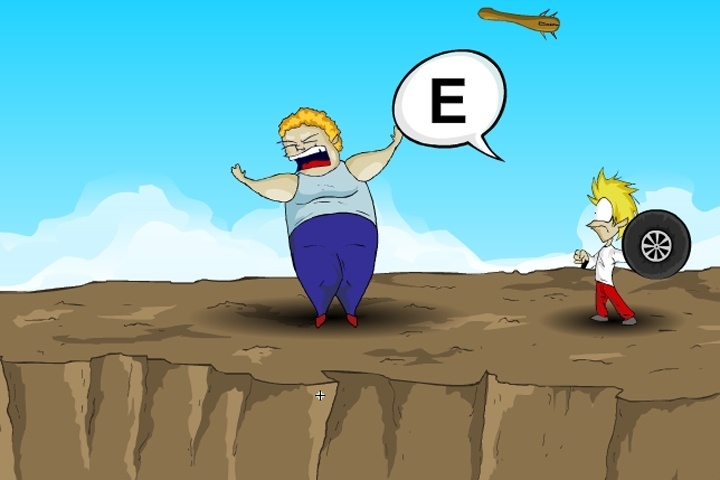 In this crazy game a fat guy is running towards you with one goal, To eat you! You need to prevent this tragic event throwing different objects to the fat guy and push him back. If you're good enough, you'll make him fall. Don't Eat me is a relatively simple game to play. It requires the entire keyboard! Do not fear. AH you do is press the key on that is displayed while playing. Do this over and over until you hit the B enemy off the cliff. The more you hit him, the weaker he becomes. Press space bar for the aid of an eagle. You may use this only once. There will be a bubble with a certain letter. You need to press this letter on your keyboard as quickly as possible to throw the next object. If you want to play Don't Eat Me games online you have come to the right place! GamesLoon adds new Don't Eat Me games every week. This is your game portal where you can find the biggest collection of free Don't Eat Me games online. Do not forget to rate our Don't Eat Me free online games while playing!